Iran’s southern coastline remains an important deployment location for unmanned aerial vehicles (UAVs). Satellite imagery from DigitalGlobe shows a probable Mohajer-4 UAV attached to a pneumatic rail launcher on the side of an unmarked airstrip located near a naval base at Konarak. The airstrip is located on the coast of Iran’s southeast-most province of Sistan and Baluchistan. Support vehicles and the associated ground control station were parked nearby. The development of the 600 meter-long airstrip was observed in late 2009 and the first aircraft hangar was built in early 2012 — the latter signaling the intention to support a regular deployment of UAVs at the airstrip. Iran announced in 2010 that it would equip all the country’s bases along the border with UAVs. 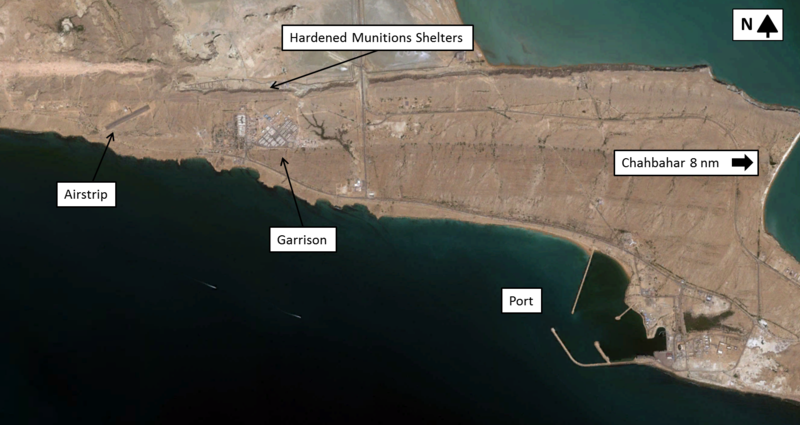 Located in an ideal position to monitor shipping near Chahbahar, the UAVs may support the Islamic Republic of Iran Navy base less than 5 miles to the southeast. Various fast attack craft and Iranian auxiliary vessels are based at this facility. According to satellite imagery, Iran’s German-built Bander Abbas and Pakistan-built Delvar class boats have been consistently deployed to the base. Iran’s Ghadir coastal submarines, an export version of North Korea’s Yono class, have also made an appearance during naval exercises. In December 2011, up to six were deployed from Bander Abbas for Velayat-90, a 10-day military exercise in international waters spanning the Strait of Hormuz and the Sea of Oman. Iranian UAVs probably support the base in maintaining situational awareness around areas of increasing economic importance. Last June, Admiral Habibollah Sayyari called the southern coast stretch along the Sea of Oman the country’s “Golden Gate”. Chahbahar, the country’s only deep-water port, is located less than 10 nautical miles to the east and is currently in the process of being upgraded. Satellite imagery shows a cutter suction dredger reclaiming land for a new container terminal. Future plans would see the port become a major hub for Central Asian exports. China and India both have proposals for the site. Growing recognition of the region’s importance may eventually see further improvements to the airstrip, similar to those observed on Qeshm. Until that occurs, current infrastructure constraints suggest Iran probably deploys its smaller UAVs with short range and endurance from this location. Chris Biggers would you explain the point of this article?